This is the perfect vegetable side dish. It resembles a pilaf with the chewy pearls of Israeli couscous. It can be served warm as a side or it can be served at room temperature as a salad. I love dishes that I can make ahead of time and this fits the bill. What’s even better is that my eight year old son will eat it! I’m not a fan of dates, but don’t leave them out. The subtle sweetness that they impart makes this dish work and the amount is so small that you hardly notice their presence as a distinct element of the dish. Don’t hesitate to vary the amounts given below to your own taste – they are for guidance only. If you’d prefer a higher ratio of cauliflower to couscous, go for it. If you want a little more tang, don’t hesitate to add more wine vinegar. The inspiration for the dish is a recipe from Food Network. Rinse the cooked couscous under cold water, drain thoroughly, and toss with about a teaspoon of olive oil. Set aside. Cook the cauliflower florets and sliced shallots in olive oil in a large sauté pan, browning the cauliflower and shallots. If needed, cover the pan to help the cauliflower just cook through. Season with salt and pepper. Add the cinnamon and chopped dates; cook 1 more minute to marry the flavours. Combine the cauliflower mixture with the cooked couscous, adding the red wine vinegar, chopped parsley, and more salt and pepper to taste. Serve. Being fortunate to live on the west coast, we eat a lot of pacific salmon. We also benefit from the wisdom of chef Vikram Vij who seems to present an endless supply of innovative ideas for local products. This is his recipe with some very minor modifications. 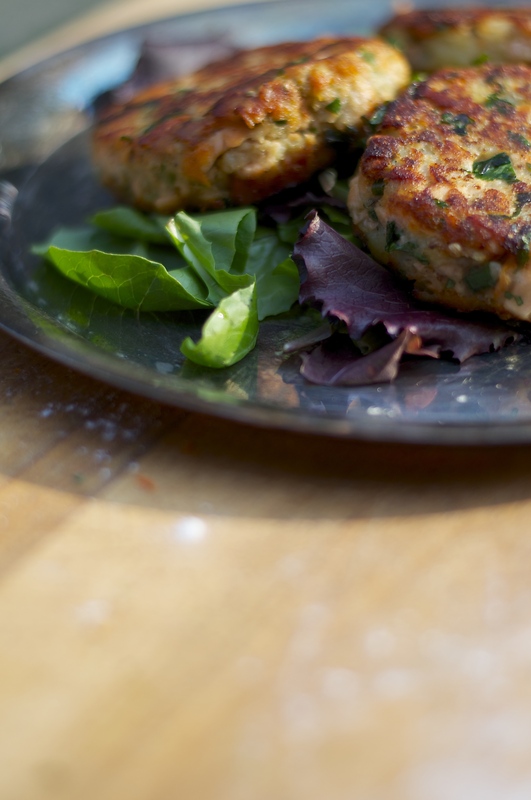 I love my mother’s Pan Fried Salmon Cakes with Dill Sauce that I posted some time ago, but these are equally as good and are easier to make, once you have the ingredients on hand. 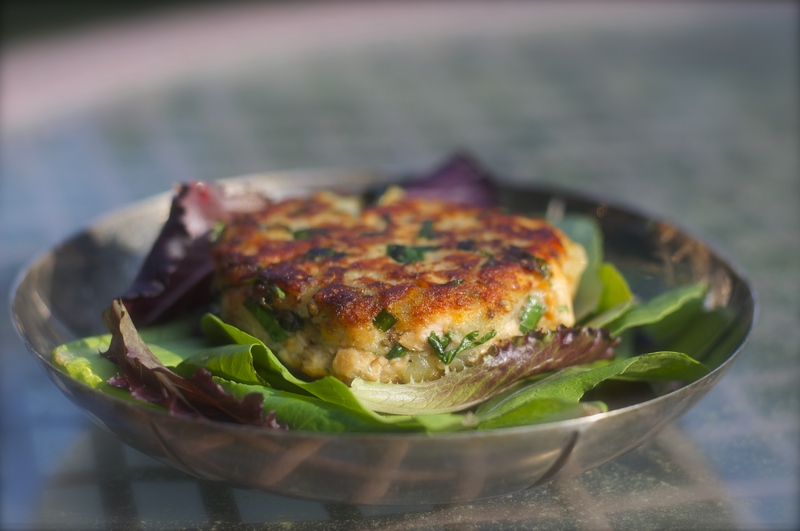 I make them with garam masala, rather than the cumin alternative, as the spice mixture imparts a more complex flavor profile, but either would be good. If you don’t have or can’t find ajwain seeds, you can substitute a little oregano for a somewhat similar flavour. Lightly pound coriander seeds in a mortar or on a plate with a heavy spoon. (You just want to break the seeds in half.) Set aside. Beat the egg in a small bowl. If you are using fresh salmon, bring a large pot of water to a boil. Immerse salmon and cook for five minutes. Remove from the heat, drain and allow the salmon to cool. Peel off the skin. Thoroughly combine all ingredients except the oil in a large mixing bowl. With your hands, form round cakes about two and a half inches in diameter and three-quarters to one inch thick. Set them on a baking tray. Heat one tablespoon of the oil in a shallow nonstick frying pan on high heat. Once the oil is hot, reduce the heat to medium so the cakes don’t stick to the bottom of the pan or burn. Place two cakes in the pan and cook for two to three minutes. Turn the cakes over and cook for another two to three minutes. The cakes should be brown and crispy on both sides. Repeat, using one tablespoon of the oil for each two cakes, until all the cakes are cooked. Peel the squash, cut it in half lengthwise and scoop out the seeds. For the best texture, it is important to peel completely through the skin past the pale yellow/green flesh to the deep yellow flesh – I have learned this through experience. Cut into small (approx 1/2 inch) cubes. Toss with oil, minced garlic, poppy seeds, and sprinkle with sea salt. Place on a parchment-lined baking sheet. Roast until fork-tender, not mushy (approx. 30-40 minutes). 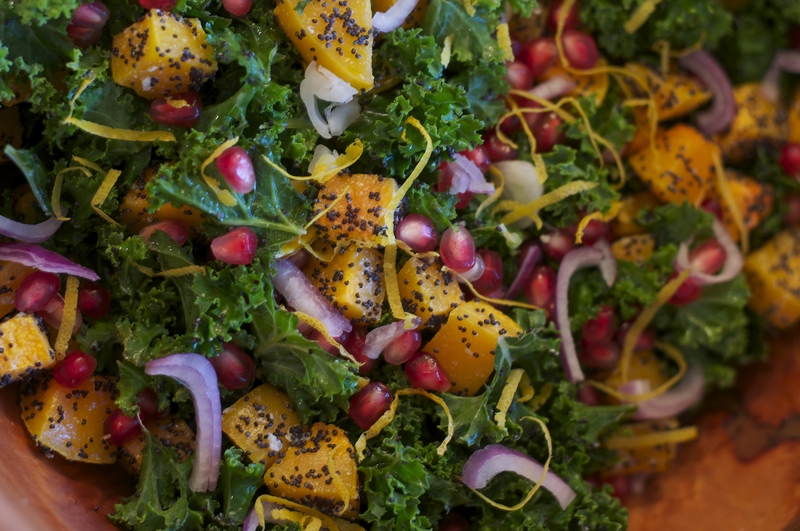 While the squash is roasting, shred the kale by slicing it in very thin strips or tearing it into small pieces. Add the juice of ½ lemon, a pinch of sea salt and massage well into kale to wilt. Set aside but repeat the massaging occasionally while the squash roasts. This step is critical to tenderize the otherwise tough kale. Seed the pomegranate being careful to keep the fruit of each seed intact. One suggestion is to fill a bowl with water, cut the fruit in half, then roughly pry out the seeds with your fingers and let them fall into the water. The seeds with white pith will float to the top – remove the pith as much as possible leaving the seeds, which will then sink. I simply pull it apart carefully bit by bit carefully extracting the seeds. When the butternut squash has finished roasting, remove from oven and let cool for 5 to 10 minutes. While it is cooling, make dressing by whisking all ingredients together. Add the squash to kale and mix. Toss with sliced shallot, pomegranate seeds, and the dressing. Garnish with lemon zest. We are at the end of the local asparagus season and I wanted to do something different with the last of the local harvest. This recipe, adapted from a recipe by Heather Christo, did the trick for me taste wise. Unfortunately, it was not as photogenic as I hoped. Next time I will look for smaller yellow fingerlings to provide more of a visual contrast for presentation. What the recipe lacks in presentation is made up in flavor. 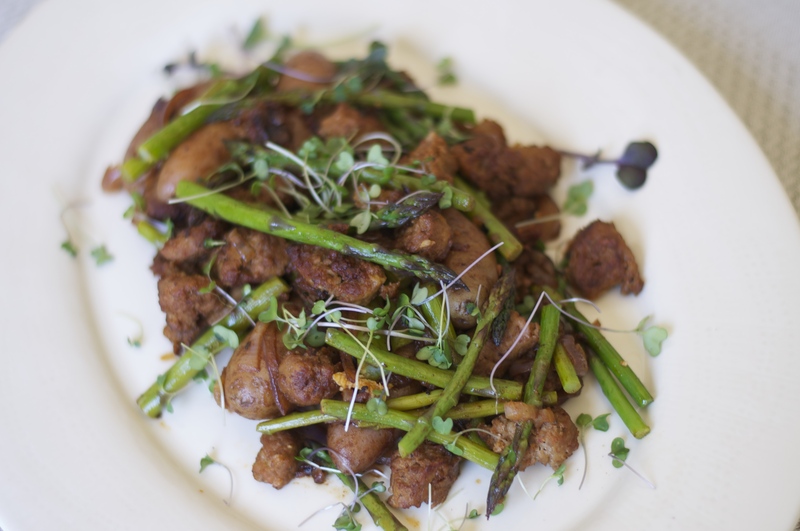 The smokiness infuses the sautéed onions which, when combined with the freshness of the asparagus and the spiciness of the chorizo, makes for a refreshing combination of flavors. 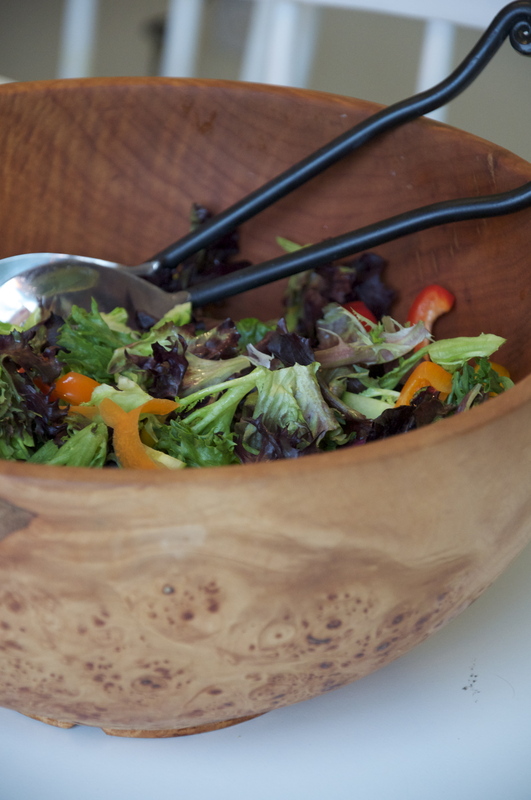 The salad is a perfect simple meal that is easily assembled. 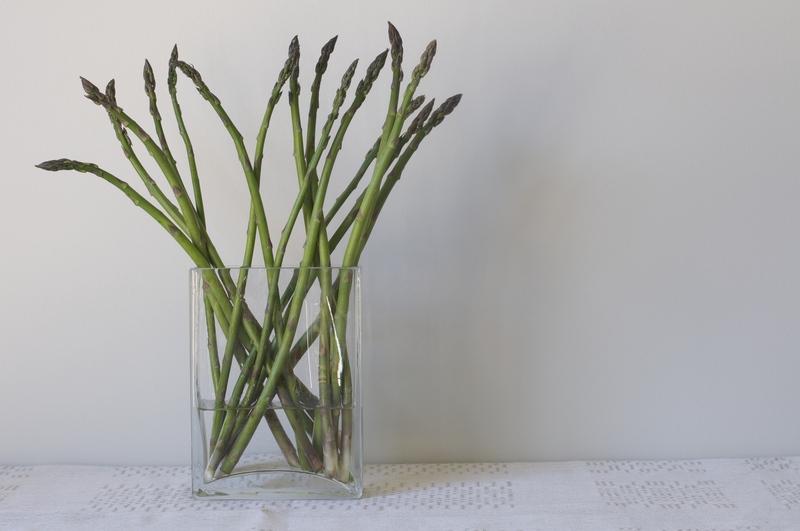 1 pound trimmed asparagus, each stalk cut into thirds. Bring a medium pot of salted water to a boil. Add the potatoes and cook until just fork tender, about 15 minutes. Meanwhile, in a large sauté pan or heavy skillet, cook the chorizo over medium heat, breaking it up as you cook, about 2-3 minutes. Add 1 tablespoon of olive oil, 1 teaspoon of smoked paprika, the liquid smoke, and the red onions and sauté another 2 minutes. Add the asparagus and sauté two minutes. Use a slotted spoon to remove the potatoes from the pot of water and add them to the pan. Stir to coat and cook, add the water and a lid and cook 2 more minutes. While that is cooking, whisk together the remaining paprika, garlic, vinegar and olive oil. When you remove the lid of the pan, make sure that the water has all cooked off. Turn the heat to low and add the oil and vinegar mixture. Toss everything together. Transfer to a serving platter and garnish as desired: I used some micro-greens. Serve hot or warm. This is a recipe that my talented mother came up with. It’s tasty, fresh, fun, and I love it. She came over to help (read: make it for me) tonight to share with you all. Place tenderloin in a shallow dish. Combine 1/4 c. soy sauce, sesame oil, and 1 tbsp of the hot sauce. Pour over steak and marinate for at least 1 hour turning several times. In blender, combine remaining soy sauce, sugar, hot sauce, lime juice, fish sauce, green onion and cilantro and blend until cilantro is finely chopped. Grill steak over hot coals, turning once until done as desired. Let stand 5 minutes (hint: always do this to help the steak retain its juices). Slice steak thinly on diagonal and place on salad. Drizzle with the dressing and serve. This dish was my favourite way of eating veggies as a picky little girl. It’s simple, quick to prepare, and a tasty side to anything you toss on the BBQ. Place the slices of cucumber in a dish or bowl. Mix together the soy sauce, sugar, and vinegar and pour over. 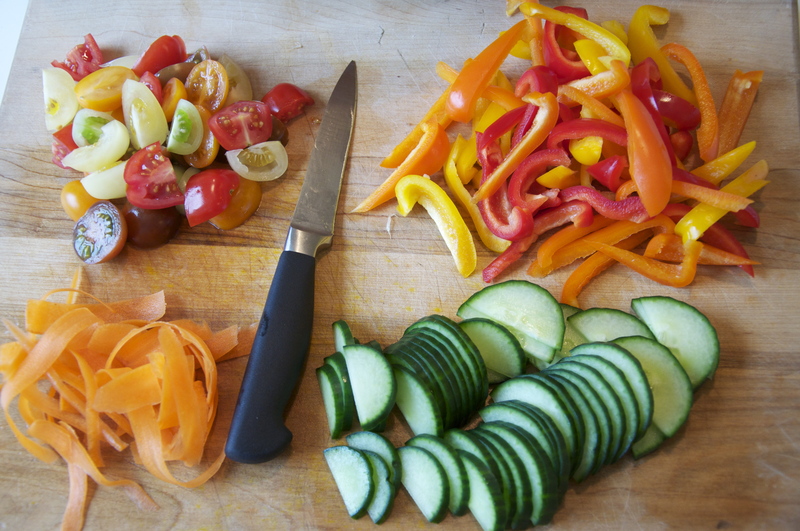 Use a fork to gently ensure that the cucumber slices are coated and refrigerate for 3 hours, occasionally re-coated slices in their marinade as the ones near the bottom will absorb the most. Serve cold as a side garnished with sesame seeds. Note: you can replace the white sugar with brown if you need to and although I haven’t tried it myself, I imagine this would work with Tamari or Bragg’s for a gluten free version.